Achieving to become a sought-after brand thanks to its philosophy of offering the highest quality with the most reasonable prices, OBIAL sets its targets being conscious of the responsibilities that come with being the leader in the sector. In this parallel, the company offers turnkey grain storage system solutions with reasonable prices through the use of materials of highest quality, superior design and production standards, and an effective customer relations management. Visit the company website, HERE. which is published by Perendale Publishers Limited. 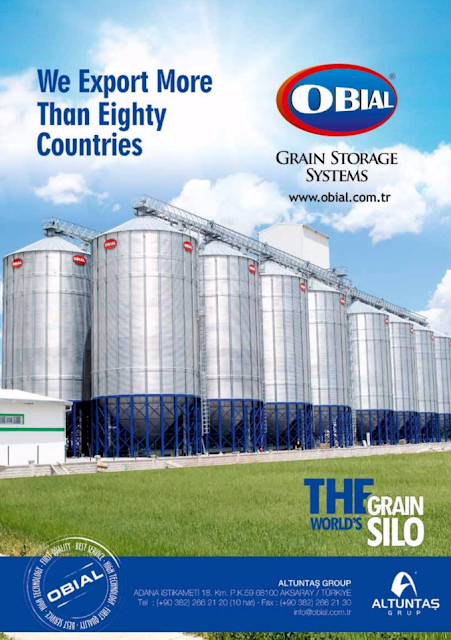 News on flour and animal feed milling, rice milling, oilseed crushing, grain storage and transportation are reported by The Global Miller which is an online offshoot of 'Milling and Grain' magazine. While the monthly magazine covers milling technology issues in-depth, the Global Miller provides a round-up of day-to-day industry developments. Our editorial team has a keen eye for the most interesting, relevant and (let’s face it) bizarre milling stories from across the world. Each weekday we find and report on the industry's top-notch news stories and package them for your perusal in one neat, easy to read service. For in-depth stories and technical updates on the milling industry - and now in SIX languages - English, French, Spanish, Chinese, Turkish and Arabic - go to our www.millingandgrain.com website. Total Pageviews - Currently running at between 30,000-50,000/month! We are astounded. Thank you. Perendale Publishers Limited produces a range of services for the grain and feed milling industries as well as the global aquaculture field. Smart phone users can read our magazines on the move and your printd copy is not to hand. Scan the QR code above or click here to download the application onto your phone or tablet. Read our sister magazine International Aquafeed on the go as well! VIV Asia 2019 just two weeks away! Build my Feedmill confirms its final line-up! ©Perendale Publishers 2012. Powered by Blogger.